This is a brand new vinyl that I just designed using a new script font ( new to me ). 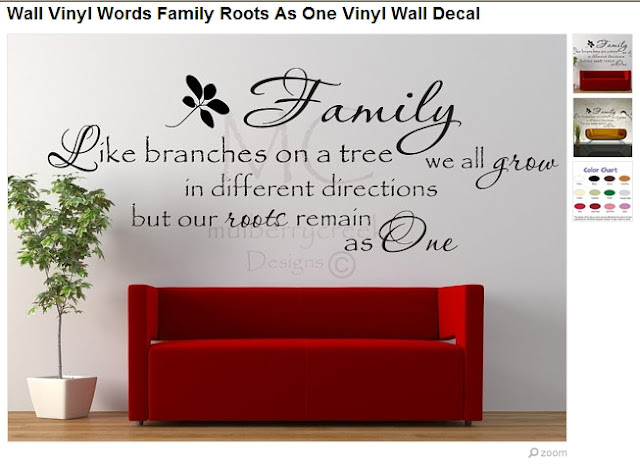 I love the family gallery walls being created in today's home decor. In addition to being fun and decorative, they also are a great conversation starter. Sometimes they are all current photos. But sometimes they can be pictures taken over generations. I kind of like the latter because I love old photos and have done some genealogy research on our family. So a combination of current and older photos can make a nice source for conversation and the telling of family stories. And some of those stories can be quite interesting! This vinyl measures approx 30" X 11". It can be re-sized however to fit within your space. I designed it with the thought in mind of being able to tuck different size frames in and around the words, but frames can also be grouped below or even off to one side. It is shown here in black vinyl but we have lots of other colors of vinyl to choose from. So gather some favorite photos and let's get to work on that story telling wall! Family Roots Vinyl Decal by Mulberry Creek on Etsy. This is really fabulous quote about family. I like it.